I look out of the train window. The passing scene in concert with my mp3 player becomes like the digital display from a graphic equalizer. The digital reactions intensifying as we approach towns and cities, subsiding as we depart. The Glimmers Fabric Mix is perfect. Who could of known that this old countryside is in binary synchronicity? An audio visual symphony. The skyline is low, punctuated by church steeples and old Tuscan looking buildings. A plethora of greens, auburns and burnt yellows flash by. Terracotta tiles, ploughed fields, farms and vineyards. A sudden pang for a glass of Merlot. No visible wildlife apart from Black Crows. Cabbages, millions of them and trees laden with a strange orange fruit that defies classification. I fall into a stare and The Glimmers snap me back as a wide lumbering grey river inches closer to an imposing cathedral. 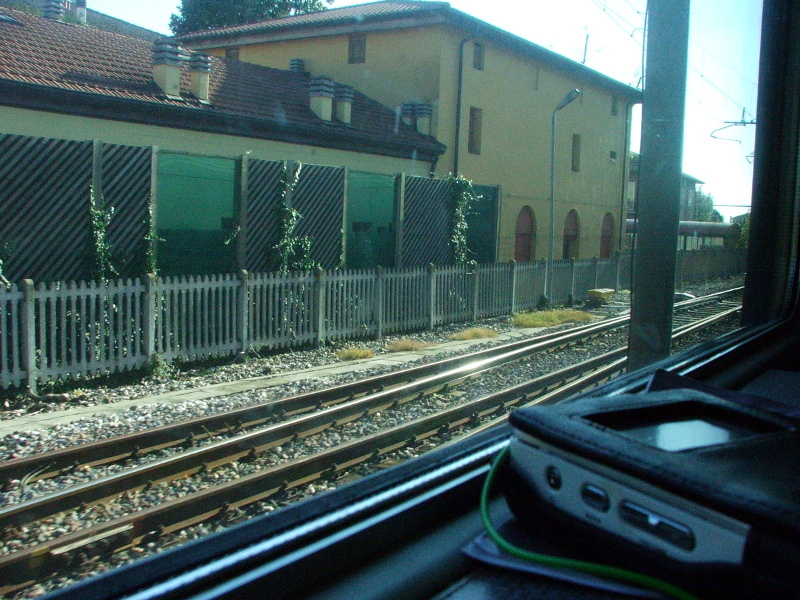 Rovigo, a station. Old buildings overgrown. A small hut is engrossed by some flowering vine type tree. Two parked rusting bulk trains, heavy and long, are behind the station. The platform is polished from years of wheeled luggage and Italian shoes. The ticket office is surrounded by Vespas and bicycles, the car park abound with Fiats and Alphas. A marble bench sits lonely and weathered next to a dry fountain. Our adjoining track is, for some unknown reason, bleached white. A dull thud indicates imminent departure. “Din Daa Daa” adds some audio strangeness to this Italian ticker tape. “My Speed boat is faster than yours” blares in my ears as we overtake a small plane on take off. No clickety click, these rails are new. We glide forward. Ferrara station is overlooked by two Ballymun-esque towers. Topped with many satellite dishes they are grey and ugly.